Sometimes a book has a twist at the end that takes you by surprise. You feel admiration for the author and maybe a bit of disappointment in yourself because you just didn’t see it coming. 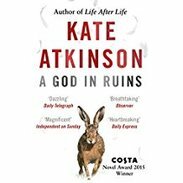 But Kate Atkinson’s plot twist is of a completely different order. You are not surprised; you are astounded. It is so unexpected that you don’t know whether to whether to admire her or detest her for deceiving you so profoundly. With a complex and sometimes confusing structure of time shifts and flashbacks, we follow the life story of a WWII bomber pilot Teddy during and after the war. On one level it chronicles the lowering standard of the middle class lifestyle in the period from pre-war up to the present day. It touches on the moral decline, or, depending on your point of view, the emancipation, which typifies society over this period. It also explores the sometimes fraught family inter-personal relationship of husband to wife, parents to children and grandparents to grandchildren. The characterisation is superb and we are drawn into the intimate fears problems and worries of this family. Then the bombshell drops. Of course, we know that these characters we have grown to love and feel for are fictional; it is after all a novel. But we have suspended our belief. When we find they are fictional even within the fiction, we are shocked. Now we have to reconsider the meaning of the novel right from its beginning.